Yet he was one man working alone against the crooks and the corrupt politicians who went hand in glove with the evil forces of the underworld. For that reason he must become a figure of sinister import to all of these people. A strange Nemesis that would eventually become a legendary terror to all of crimedom. He was still thinking. Just what the character would be that he intended to assume was still vague in his mind. He only knew that it would have to be some nubilous creature of the night that lurked in the shadows. He glanced at the oil lamp burning on a table. Then he swung around, suddenly tense. In the shadows above his head there came a slithering, flapping sort of sound. Though I cannot say that The Bat is the most interesting or well-written pulp fiction I’ve read, it is a fascinating look at the almost completely unknown prehistory of one of comics’ greatest character! The Bat isn’t even the only batlike character to appear before Batman; apparently, bats were on the mind of many writers of that era. In 1933 and 1934, science fiction writer Murray Leinster wrote six stories about “The Black Bat” which appeared in Black Bat Detective Mysteries. In 1939, appearing essentially simultaneously with Batman, another series of “Black Bat” stories were published in Thrilling Publications, with lead author Norman Daniels. This latter set of stories nearly led to lawsuits between D.C. and Thrilling, with each side claiming the other was a copy. Bob Kane, the creator of Batman, himself credited the movie The Bat Whispers (1930), featuring an unheroic murderous “Bat”, as his inspiration. Nevertheless, the similarities between Batman and The Bat are so striking it seems reasonable to assume that Kane was at least indirectly influenced by the earlier character. “The Bat Strikes” opens with an investigative journalist named Dawson Clade on death row, on the eve of his execution. Clade is innocent, having been framed by the network of criminals and corrupt politicians he was investigating. The governor is willing to grant clemency, but is murdered himself just as he sets pen to the stay of execution. In a series of events, Clade is freed, and his execution faked. Now free to hunt down those who tried to kill him, he chooses The Bat as his identity, as described at the beginning of the post. The first three serials of The Bat describe how he brings the criminals who framed him to justice. The Bat’s methods are both similar and quite dissimilar to his more famous counterpart. Like Batman, The Bat uses theatrical methods to unnerve his opponents and put them off-balance. The Bat employs remote radios to speak to his victims remotely, and decorates their homes with luminescent paint. He uses underworld contacts to gather information against his enemies, and sets them up so the police can catch them. His personal attire and weapons, however, are very different from Batman: he dresses in street clothes, with only a black hood emblazoned with a white bat as a disguise. Instead of a utility belt, his personal tools are a vapor gun which sprays knockout gas — and a handgun! Like Batman, The Bat communicates with the police, and in particular has a close relation with one officer. For The Bat, this officer is Detective Sergeant Jim Burdoon, who is constantly trying to incarcerate the vigilante. “I hear you,” the Bat’s deep voice answered. They all turned at the sound of the voice. In the doorway of the bedchamber stood the Bat, automatic held ready, his eyes gleaming. This appearance sparks off a multi-chapter chase in which The Bat is nearly busted several times! Now, if you were a costumed vigilante, and the police officer trying to arrest you asks for a face to face chat, would you: (a) meet him face to face, or (b) not meet him? The Bat takes pointless risks at times which make him seem psychologically self-destructive. As I said, I enjoyed the stories. The first three very nicely serve as a trilogy which ties up The Bat’s original quest to incarcerate his framers. The writing style is crude, and the plots barely make sense, but the tales are entertaining, though people fascinated by pulp history will get the most out of them. I should note that the book includes an introduction by pulp fiction author and scholar Will Murray, who discusses the history of The Bat and argues quite strongly that the author was none other than Johnston McCulley, who was the author of the Zorro tales. So maybe the creator of The Bat influenced Batman in another way — Bob Kane was also supposedly inspired by the Zorro movies! This entry was posted in Adventure fiction, Mystery/thriller. Bookmark the permalink. 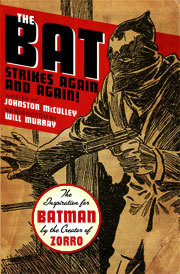 5 Responses to Johnston McCulley’s The Bat Strikes Again and Again! If memory serves correctly (and it sometimes does not), Bob Kane’s Batman also carried a handgun in the early strips. I have to admit that I don’t have first hand knowledge of that, though… I was just close friends with a seriousBatman fan in high school. I don’t know myself about that, though it seems plausible. The Batman we know today evolved quite gradually over many years and many interpretations. Yeah, he definitely has. The original Batman did carry a handgun, as well as kill off several of his adversaries. They ended up changing that because a.) The Comics Code made them, and b.) They wanted to have reoccurring villains, and that couldn’t very well happen if Batman killed them all off. Drat! How do I contradict a question?! I couldn’t tell you. Every time I visit those cities where everyone lies in one and tells the truth in the other, I always end up in the wrong city.